I’ve been meaning to write a post about one of my favourite places to visit in Portugal for a while. 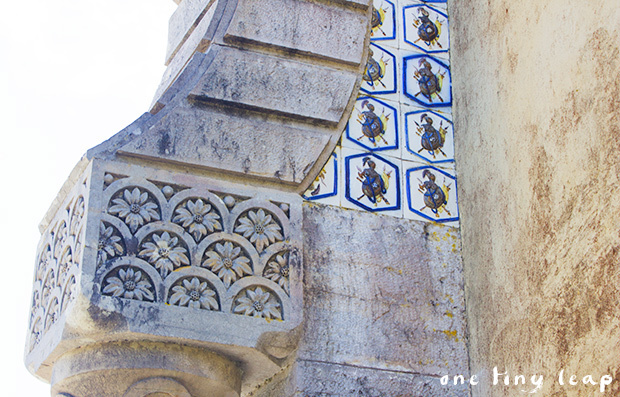 Growing up in Lisbon, I have always felt a nostalgia for Sintra, for its dramatic scenery and grand architecture. They make my heart ache with ‘saudade’ for an era I never lived but often heard about. 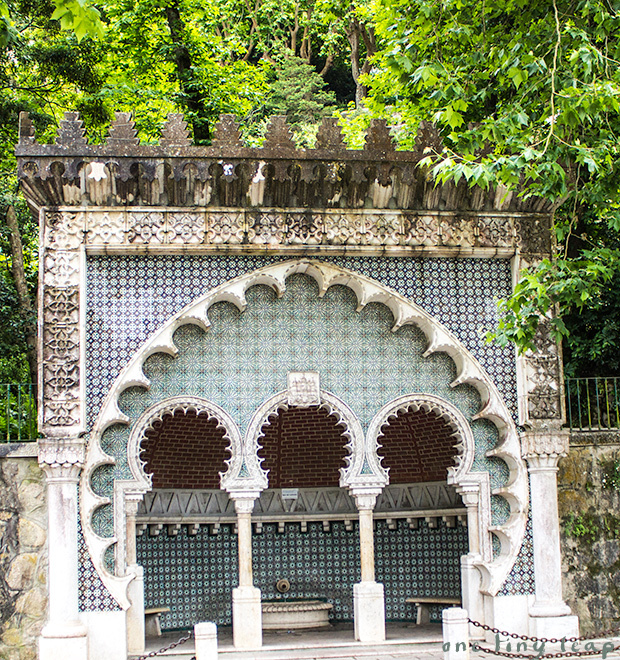 The Portuguese city of Sintra is an enchanting place and a UNESCO World Heritage Site that has inspired generation after generation of renowned painters, poets and literary names, and nowadays attracts swarms of tourists from around the world. Surrounded by lush and tall greenery, the hilltop city is at its most perfect during the summer months, when the cooler temperature is a welcome escape from Lisbon’s stuffy city heat. 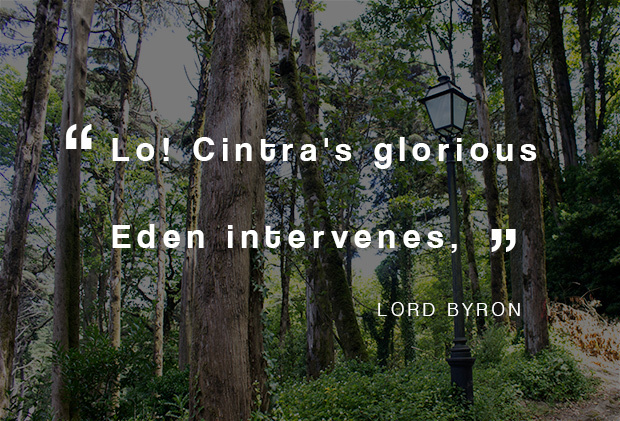 That’s also one of the reasons why it was the chosen summer residence of the Portuguese Royal Family for centuries. 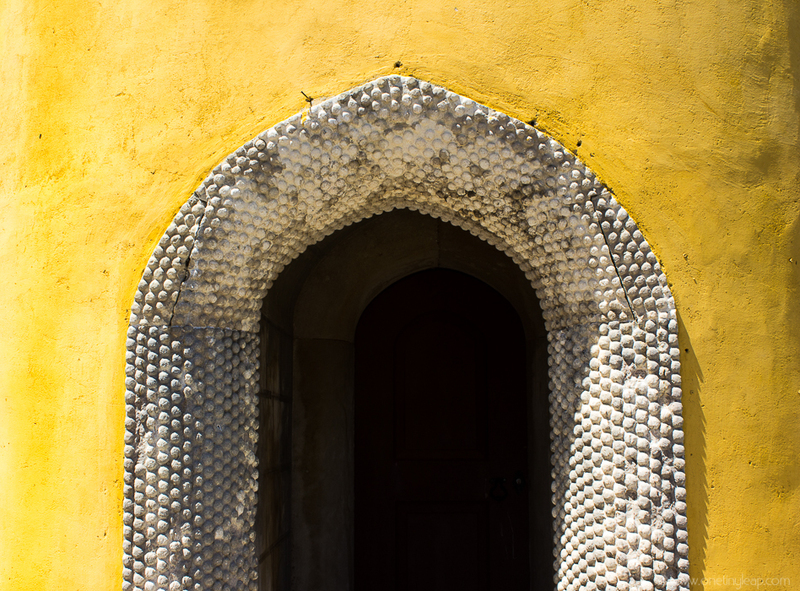 As you drive into Sintra, you’ll see the Moor’s Castle and Pena Palace on the rather steep Serra de Sintra, sheltering the cosy and quaint historical city centre. The winding and colourful cobbled streets are very attractive, lined with traditional pastelarias (bakeries) and dozens of shops selling trinkets. If you manage to navigate the crowds, do take the time to wander off the main streets to escape the tourist traps and witness the real charm and grandeur of this unique city. Get on the Pena hop-on/hop-off bus for 5 euros. 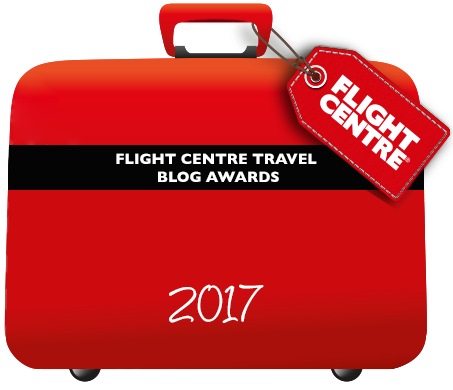 Book a taxi, executive car, or whatever takes your fancy. Get yourself in a tuk tuk for a bumpy but fun ride. Drive up to one of the car parks located near Pena. If you choose this option, you’ll still need to climb uphill for about 300m or more to the Palace. You’ll be awestruck at the sight of the Moor’s Castle. 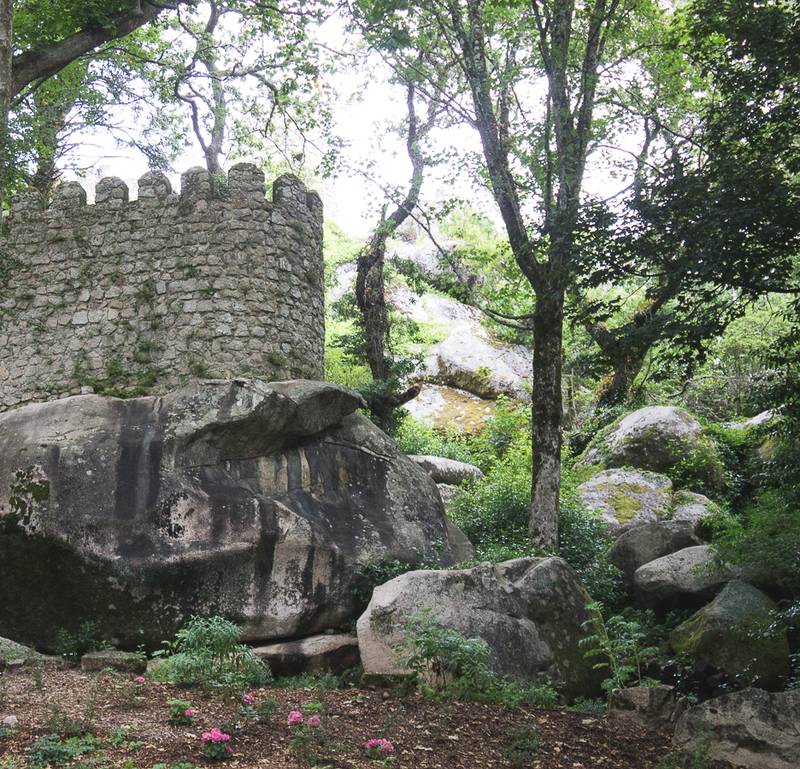 One of my favourite walking grounds, the castle is perched on the Serra de Sintra, with vertiginous views stretching as far as the Atlantic Ocean. 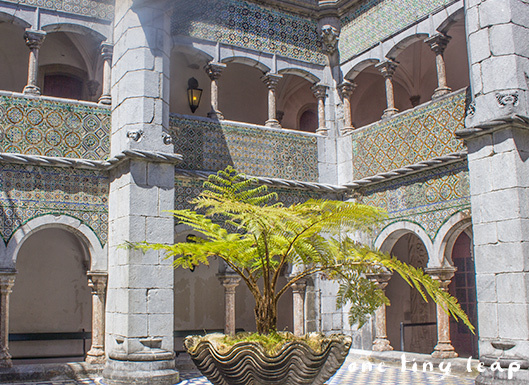 The remaining building and ruins you can visit are the result of a long and difficult history, originating in the 10th century and running up until the assassination of the Portuguese king and his heir in 1908. The castle takes around an hour to thoroughly explore, and it’s a very pleasant, gentle walk. 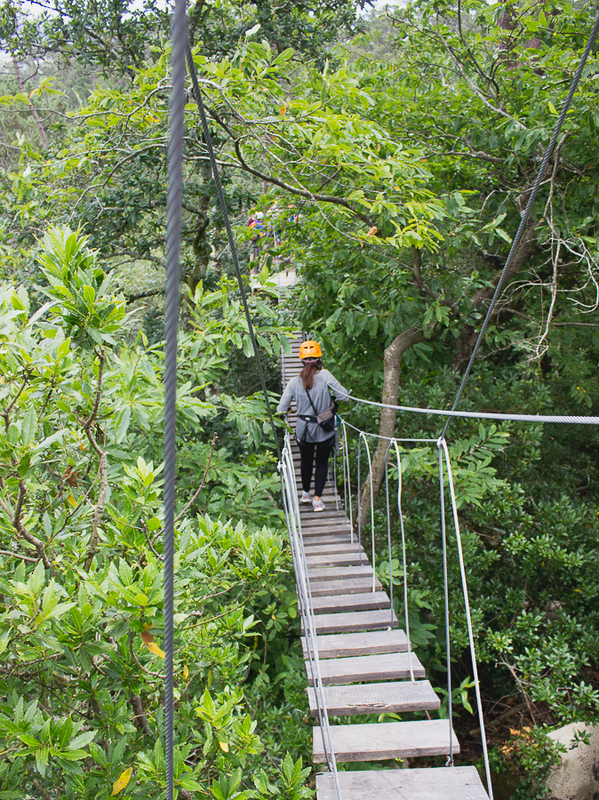 Now, you can zipline through it if you wish, which is next on Rob’s list of things to do. 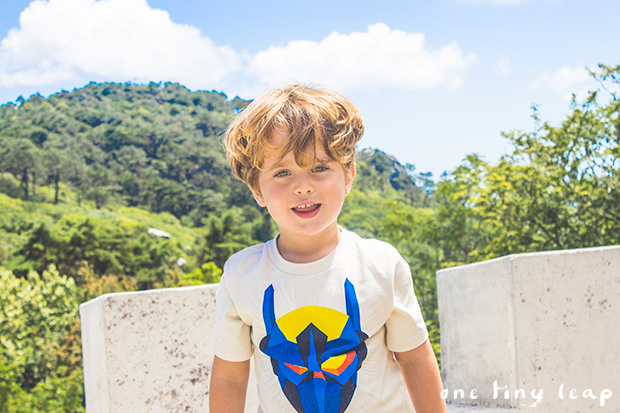 With young children you need to keep them by you at all times as wandering around the ruins isn’t especially child-safe, but there are lots of little rocks and benches they can play jumping on and off, as Charlie loves to do endlessly. 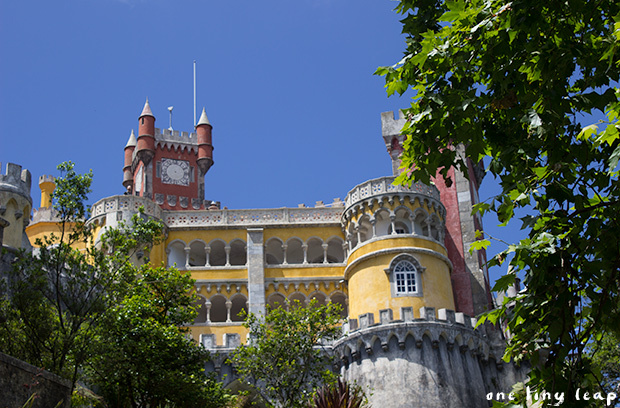 A good 10 minute uphill walk from the castle, you’ll find the exquisite former summer residence of the Portuguese Royal Family: The Pena Palace. This exuberant and colourful palace is a perfect example of what royal money did when it had no limits (similar to another example we’ve visited, the Brighton’s Royal Pavilion). As we walked through it, we kept finding fantastic mixes of textures, detail and the playful combination of bright and bold colours, together with gorgeous tiling give the palace a wonderfully quirky facade. We found ourselves spending the majority of the time exploring the various terraces and courtyards, but if you wish to visit the royal quarters you can also do so. Baby-buggies are parked at the entrance so you will need to carry little ones around. Parents of toddlers beware that when roaming the battlements there are some steep drops protected only by low stone walls, so you will need to keep a tight grip. 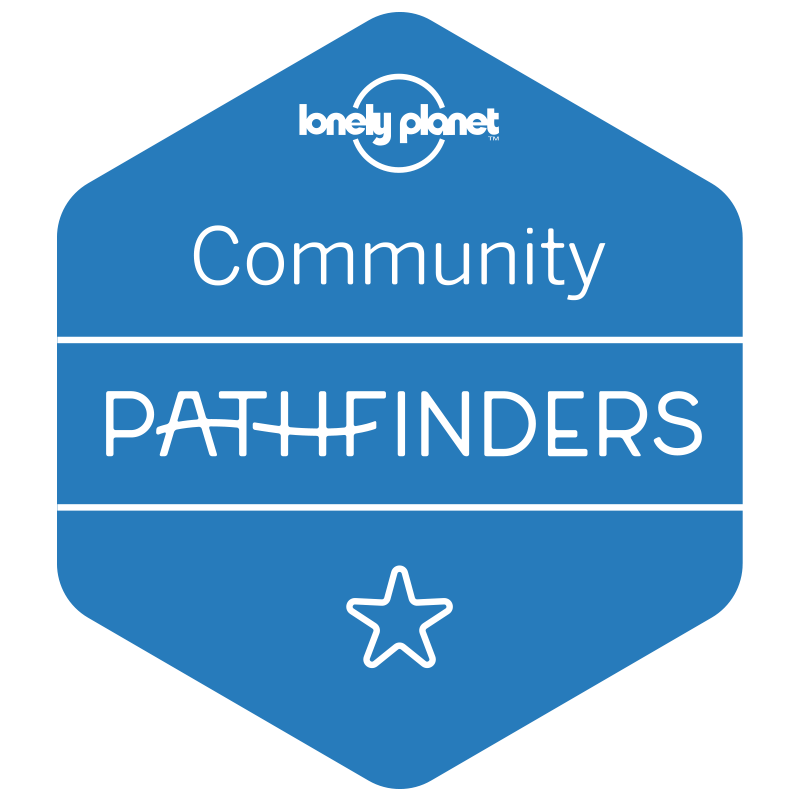 The views of the surrounding countryside are truly epic, so bring a camera (as you can see from the endless photos featured in this post, we did). 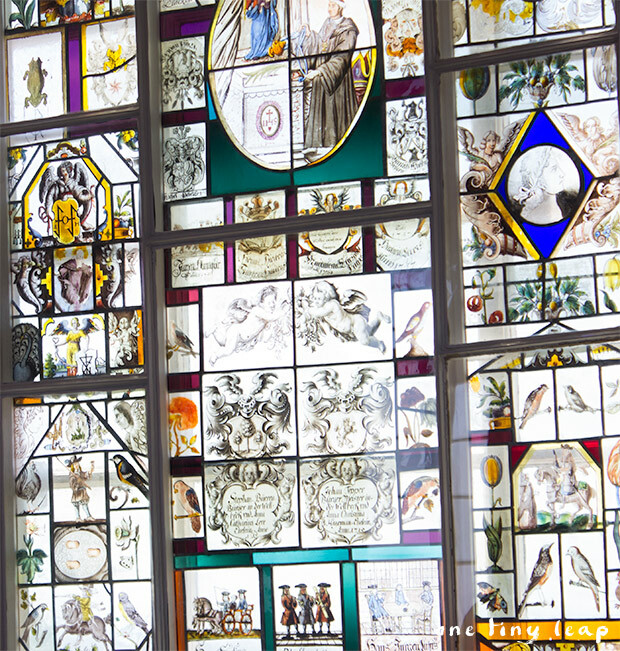 This gorgeous stained-glass window is a beautiful example of the exuberant detail featured in the palace. 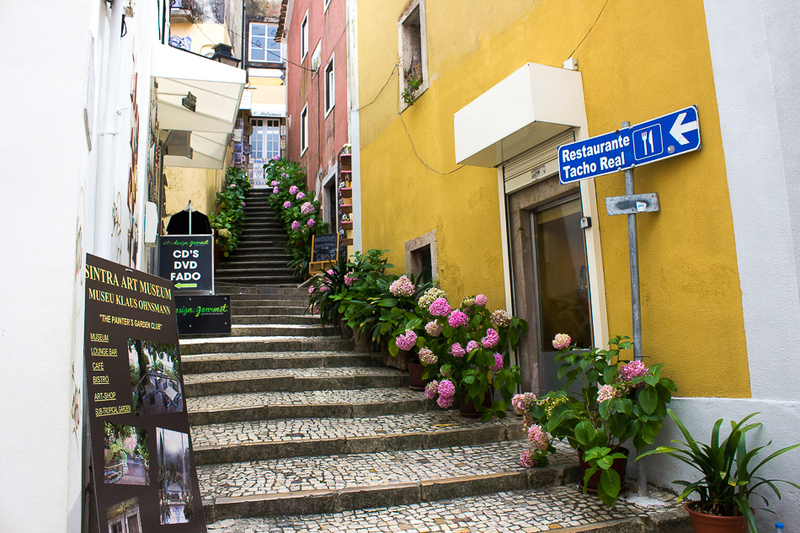 Although the idea of castles and palaces may appeal to all the family, the journey to Sintra, walking in the city and the climb up to the castle and palace truly are the enemy of the buggy. I think they are worth the hassle, but if you have a very small child, I would consider either hiring a car so that at least you have the flexibility (and luxury) of not carrying all your baby paraphernalia with you, or taking a baby sling and an umbrella buggy. 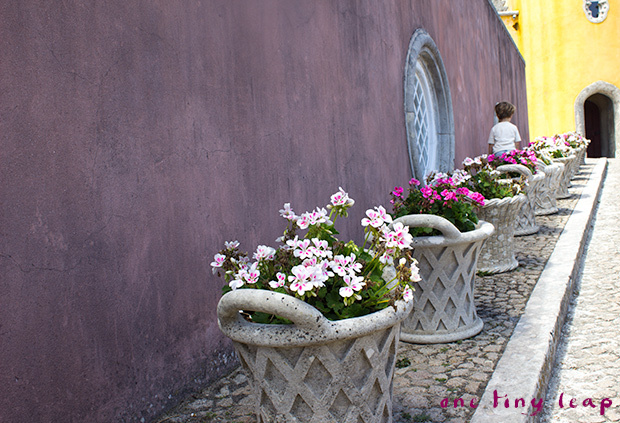 If you don’t want to fuss around folding buggies, pushing a small child uphill or dealing with cobbled pavements, I would recommend you consider going on a day trip to beautiful Obidos instead, which although perhaps not as grand as Sintra, makes for a wonderful day trip that we found to be very child-friendly. AM: An easy morning roaming through the historical centre, sipping coffee and eating cake. 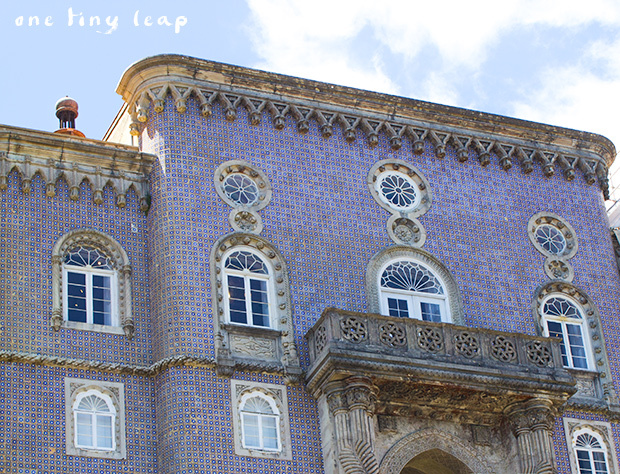 Try to visit the Palacio da Vila (easily recognisable by its two giant chimneys), for its endless collection of Portuguese tiles. LUNCH: Nothing like preparing for a bit of exercise to excuse a proper sit-down lunch. Have a filling but not too heavy meal to give you energy for the climb. 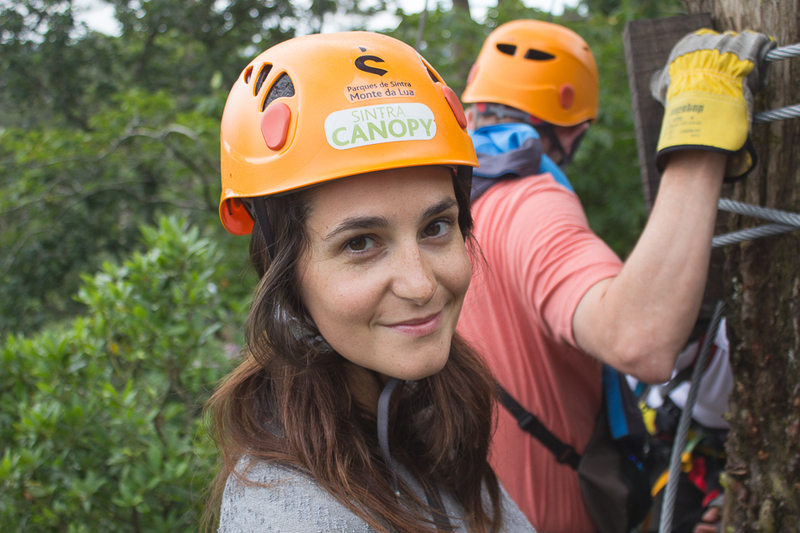 PM: An afternoon spent filling your lungs with the fresh mountain air, basking in the stunning views of the Serra and experience a bygone era at the Pena Palace. By train: Trains depart every 15 minutes (weekdays) or 30 minutes (weekends) from Oriente, Rossio, Entrecampos and the Zoo stations. You can purchase tickets on site, at the bilheterias (ticket office). Coach tours: The City Xplora offer a pretty good deal with tickets from £13 per adult / £6 per child. Getting to the Castelo dos Mouros & Palacio da Pena: There is a hop on/hop off bus that takes you up the steep hill for a bargain €5 (do this!). 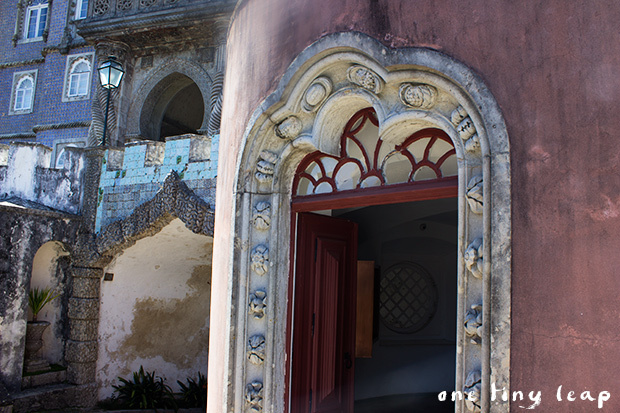 At Palacio da Pena: After entering the palace, you will still be able to choose to take a shuttle up another steep hill that takes you to the palace’s door. We didn’t do it, and regretted it! The shuttle costs €2. Cantinho de Sao Pedro is a lovely and spacious restaurant with a traditional menu at fairly good prices. An average meal cost will be €15 per person including drinks. nb: This post isn’t sponsored, nor have I received any kind of compensation for recommending these businesses. 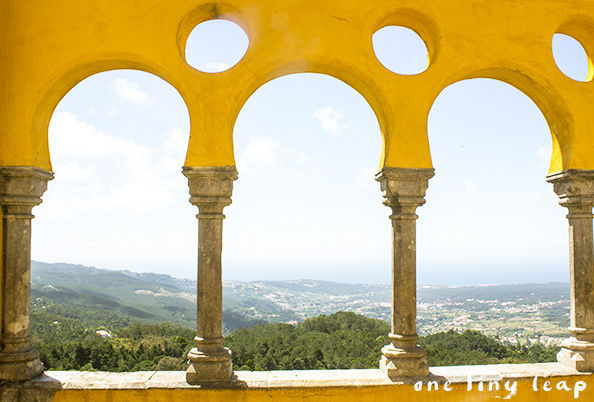 I simply hope my recommendations help you plan your very own family trip to Sintra.